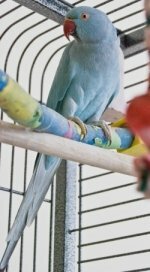 Your medium-sized pet birds needs certain types of parrot cages. There is no one-size-fits-all when it comes to your bird’s cage. When shopping for parrot cages, there are a lot of things you need to take into consideration. This includes and is not limited to: the cage size and shape, material, door type, cage bottom, playtop safety, and for the sake of your wallet, price and transportation. For your own reference, and so you will know that the bird cages we recommend really are the best for your bird, we have outlined the most important cage features you need to take into consideration when shopping for bird cages on your own. The table below shows the recommended cage size and bar spacing depending on the size of your pet bird. 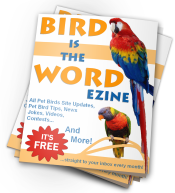 The highlighted row contains the recommended specifications for medium pet birds. So, while you’re looking, keep in mind that these cage sizes are the absolute minimums and bigger is always better (just make sure the bar spacing is right as well). We know cage hunting isn’t easy, so we’ve done the hard work for you and have found the best cages on the market at the best prices for each type of bird. This is our favorite cage for medium pet birds. It is a great cage at a fantastic price! While the depth is 2 inches shorter than the recommended minimum, the extra width and height make up for it. This cage is very roomy and has a play top so your bird can spend plenty of quality time outside his cage. Highly recommended! Cage Includes 2 solid wood perches, 4 stainless steel cups, 2 pull-out trays & 1 pull-out bottom grille. Comes in a Sage colored non-toxic, powder coated finish for elegance and durability. Select Series wrought iron cages include 2 solid wood perches, pull out drawer and bottom grille, 4 stainless steel cups, top playpen and seed guards. The cage comes in a non-toxic, powder coated finish for elegance and durability. The seed guards have rounded corners and the bottom grille and tray remove quickly for easy cleaning. Wire spacing is 3/4″. Cage Dimensions: 30″L x 22″D x 63″H. Premium Wrought Iron Bird Cage Dome Top Opens as a playground. Victorian Cage with Opening Top Overall Height 64″ Ideal for conures, cockatiels, congo african greys, small cockatoos and amazons. 3 feeder doors and 1 breeder door 32″x23″x45″ OH-64″ 5/8″ spacing. Victorian Cage with Opening Top Overall Height 61.5″ Ideal for conures, cockatiels, congo african greys, small cockatoos and amazons. 3 feeder doors and 1 breeder door 24″x24″x41″ OH-61.5″ 5/8″ bar spacing. Easy climb sides, easy clean powdercoat finish. Slide out trays with top Quality details. Dimensions: 29″ H x 28″ W x 22″ D.
Includes Corner Style Cage, Welded Bar Design, Play Top with Toy Hook, Interior Perch & 2 Stainless-Steel Food Bowls, Safety Tabs on all doors, Removable Tray and Grate for easy cleaning, Removable Seed Guard, and 4 Screw-In Casters. This cage set is ideal if you have multiple small birds that can’t be housed in the same cage. No nuts/bolts needed, thus easy to assemble. Quick knockdown for easy transport. Bird-proof door locks are used. Includes four stainless steel cups, two interior natural wood perches and a bottle of touch up paint. Removable grates and trays for easy cleaning. Food bowls are accessed from outside the cage for bird owner safety. Food bowls “lock in” the cupholder when the food door is closed so the bird cannot pick up and throw the bowl(s). Gold door latches and wheels/casters on white Multi Vista cages. Silver door latches and wheels/casters on platinum Multi Vista cages. All side panels come with removable nest box doors. Powder coated finish, Color: Green, Bar Spacing: 3/4″. Slide out bottom grate & trays (Top & Bottom), 4-side seed catcher. “This is a handsome, carefully designed, and sturdily made cage that makes a perfect home for any parrot from the “large end” of small to medium. The powder-coat finish is thick and tough. (It looks like a heavier-duty, shinier version of the enamel-type finishes on many major kitchen appliances. It’s definitely too hard for birds to mar with their claws and beaks.) Everything has been designed for easy access and cleaning. Compared to the two cages I had, the new ones make cage cleaning as close to a pleasure as it is ever likely to get: nothing sticks stubbornly to the finish. The bottom tray sits a good 8 inches below the grate, so even the most inquisitive parrot can’t get into the mess below. This is also an extremely safe cage. There is no filigree in which claws or other body parts can get snagged. The latches are simple to operate but impossible for a bird to manipulate from inside: you have to turn the latch through an arc of 180 degrees before you can slide it open (no parrot inside has enough latitude to do this: the bar spacing makes it impossible for the bird to push the latch more than about 25 degrees). The best thing of all is that my birds (Indian ringneck and Meyer’s) love their new homes. They seem to prefer their topside playgrounds to former play areas — which makes it much easier to keep an eye on them. The interior has room enough to arrange plenty of toys and perches without any sense of crowding. Highly effective EZ to remove seed guard helps keep the mess in the cage. The Super Pet EZ Care Playtop Cage for medium birds is the perfect home for Amazons, African Greys, and other medium sized companion birds. Designed and manufactured to provide a safe and comfortable living space for your special pet. EZ Access Front Panel provides convenient Door-N-Door format for easy cleaning, feeding and bonding. Complete front panel swings open for easy access and locks securely with spring loaded double locks. EZ Glide deep drawer for easy clean up. For the out of cage experience, this habitat features a playtop with an Open Air Perch and Cage Top Activity Bar with multiple points for attaching toys and enrichment tools plus two ceramic crocks. EZ glide locking casters for mobility. Horizontal side bars allow EZ climbing and promote healthy exercise. Cage includes an inside natural shaved wood perch and two ceramic crocks for food, water and treats. 32″ X 23″ x 64″ Inside Height 46″ Ideal for Macaws, Cockatoos, congo african greys, large parrots and amazons. 3 feeder doors and 1 breeder door, 5/8″ spacing, Fan Opening Front, bottom cabinet with magnetic doors. We hope we’ve helped you in your quality cage hunting endeavor!